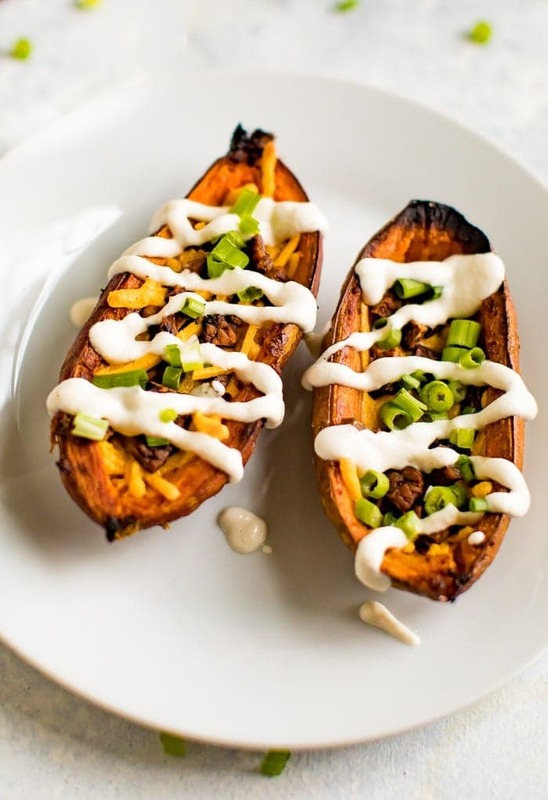 Healthy sweet potato skins with cashew sour cream, dairy-free cheese and tempeh bacon. Crispy and loaded with cheesy, smoky flavor, no one will guess these are plant-based! This post is sponsored by Lightlife Tempeh. While I’m not a huge football fan, Isaac is obsessed with it, and every Sunday from September through February is basically Football Day in our house. 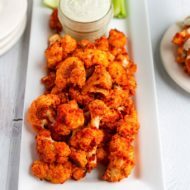 I started playing fantasy football over the past few years and that’s helped me to care a little more, but in general, the best part of sports for me – especially football – is the snacks that I get to enjoy while “watching” the game. And football definitely wins for the best tailgating/game-day food — chili, chips, guacamole, black bean dip, cauliflower wings… give it all to me. 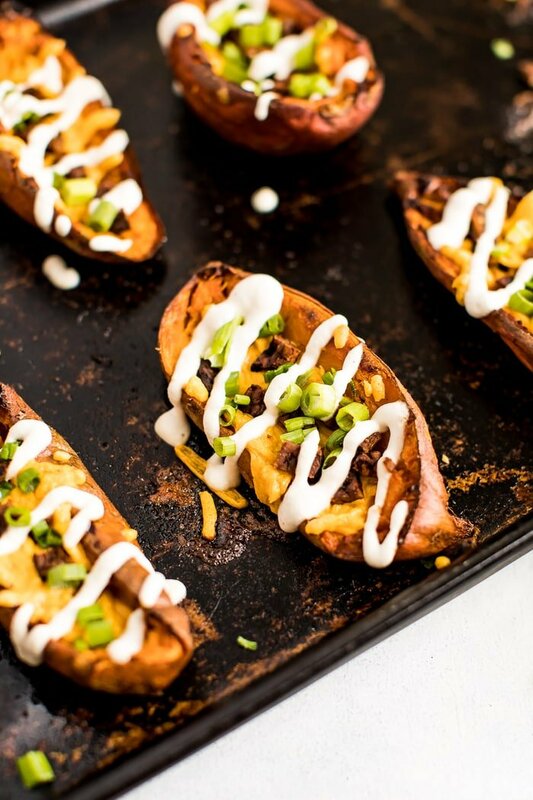 That’s where these potato skins come in… they’re my new favorite game day snack! 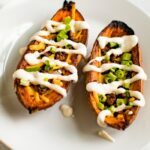 Traditionally, potato skins are made with white potatoes and they are loaded with sour cream, cheese, and bacon… aka lots of calories and not really EBF approved. To this point, I don’t think I’ve had potato skins since high school, but oh man… one bite of these sweet potato skins and I was quickly reminded how good they are. 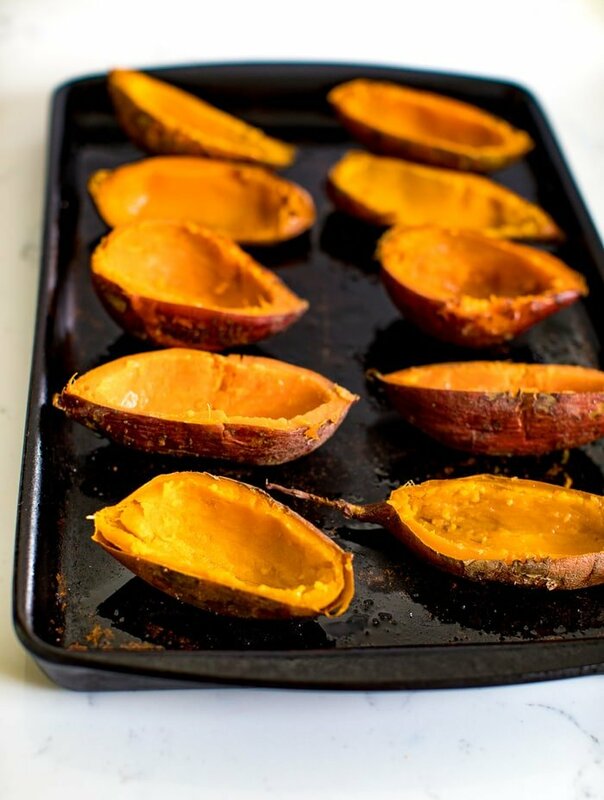 For these skins, I decided to use sweet potatoes instead of white potatoes because I don’t think white potatoes are particularly healthy (sweet potatoes have a few extra nutrients and they’re sweeter, so I prefer them!). But honestly, I have never met a potato I didn’t like, especially when they’re crisped to perfection. When I was growing up, my favorite side dish was skillet fried potatoes that my mom would serve with beans (topped with ketchup) and cornbread… aka all the carbs! Once the potato skins have finished cooking, the only thing left to do is pile on all of your favorite toppings. If you’ve been following my blog, you know that I love tempeh (and have a ton of tempeh recipes). People are often intimidated by tempeh until they actually prepare it, but there’s nothing to be worried about. 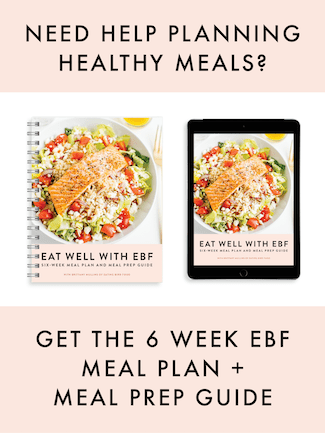 It’s actually one of the easiest proteins to work with! That being said, how you prep your tempeh makes a huge difference – and marinating is the way to go! But that takes time and a little prep – that’s where the organic smoky tempeh strips (Fakin’ Bacon) from Lightlife comes in. It already has a sauce so it’s ready to heat – and eat – and it is delicious! No prep required other than to throw it in the pan and warm it up. Tempeh was actually the first product Lightlife came out with when the brand was founded in 1979. They’ve had almost 40 years to perfect it and you can tell. 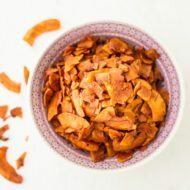 The Fakin’ Bacon works great for vegan breakfast sandwiches, breakfast bakes, main dishes and as a topping for salads. I use it for my vegan cobb salad and it’s so good! The next star of the show is the homemade cashew sour cream. 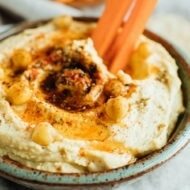 If you are vegan or intolerant to dairy and have been missing your sour cream, please make this. It’s so simple to make, so creamy and only five ingredients. I feel like I’ll need to have this on hand throughout the winter to use on top of homemade soups. I’ve been experimenting with dairy-free cheese for a while now and have really been enjoying Chao Creamery. Again, if you’re intolerant to dairy, I know how hard it is to say farewell to cheese. Thankfully, the dairy-free cheese world has come a long way over the past 5-10 years, and these two brands never fail me! 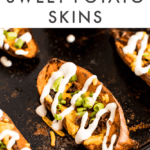 If you try these healthy sweet potato skins please let me know how you like them in the comment section and don’t forget to leave a star review. 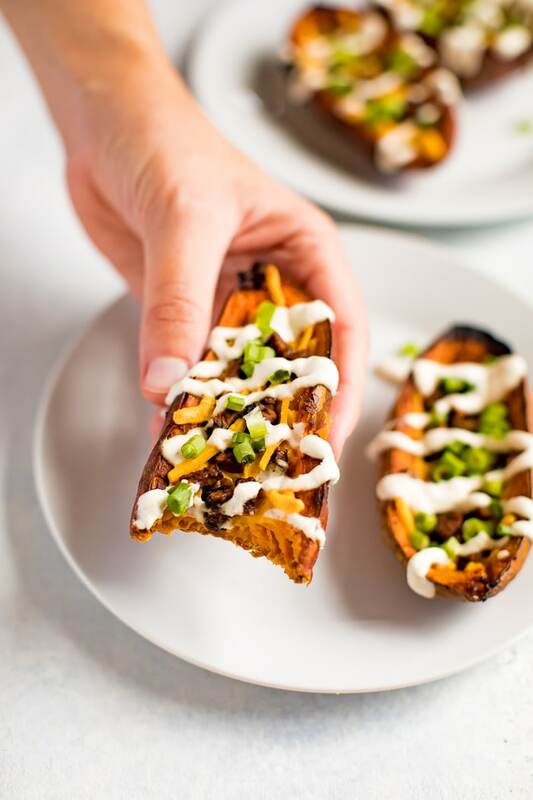 Healthy sweet potato skins with cashew sour cream, dairy-free cheese and tempeh bacon. Crispy and loaded with cheesy, smoky flavor, no one will guess these are plant-based! Preheat oven to 350°F. Wash, scrub and dry sweet potatoes. Use a fork to poke several holes in each and place the potatoes on a baking sheet in the preheated oven. Bake for about 50-60 minutes or until potatoes are tender and a fork easily pokes through the skin/flesh. Remove potatoes from the oven and let cool. While potatoes are baking, make the cashew sour cream if you haven’t already and cook your tempeh bacon as well. Place a non-stick pan over medium-high heat, add about 1 teaspoon of olive oil and cook tempeh strips for about 2-3 minutes on each side or until crisp. Let cool before cutting or crumbling the strips into tiny bacon bits. 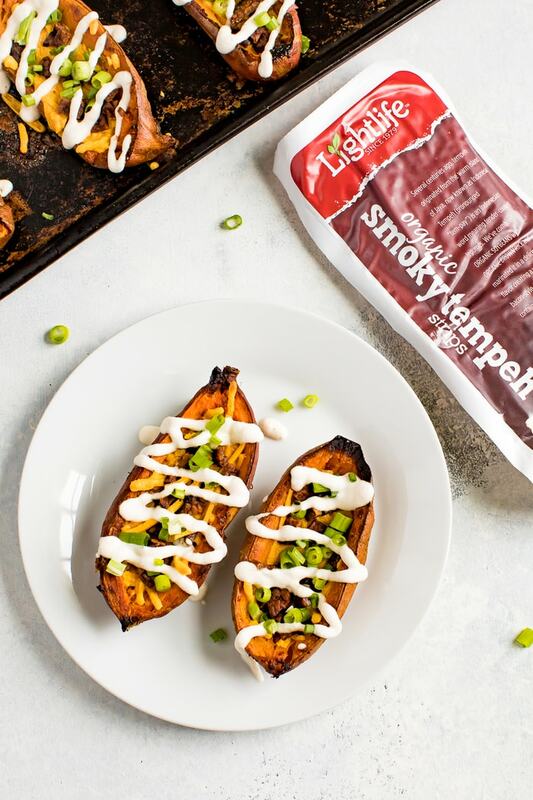 Once potatoes are cool enough to handle, carefully cut each lengthwise in half and scoop out all but 1/4 inch of flesh to create the sweet potato skins. Coat each skin (on both sides) with a little olive oil, sea salt and pepper. Place skins flesh side up on the same baking sheet. Turn heat on the oven up to 450°F and bake skins, flesh side up for 10 minutes, flip potato skins and bake for another 15 minutes. 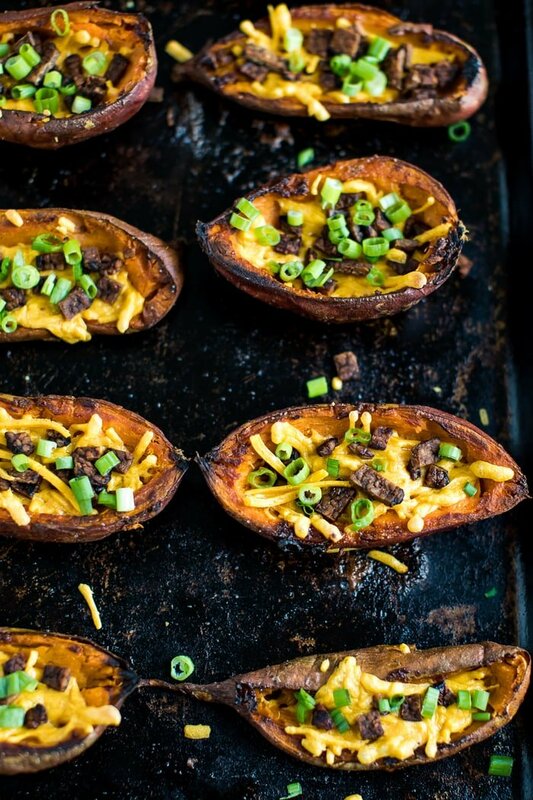 At this point, your potato skins should be turning golden brown and getting a little crisp on the outside. Flip skins and add cheese and tempeh bacon bits to the cavity of each. Turn heat on the oven to broil and place the potato skins back into the oven until the cheese melts, about 2 minutes or so. Remove skins from the oven and once cool enough to handle, top with chilled cashew sour cream (spoon it on or drizzle it on) and fresh scallions. Enjoy right away! What snack or meal from your childhood would you recreate for a healthier version? Are you a football (or tailgating) fan? I can’t wait to try these! I just made a double batch of your tempheh bacon this weekend! Ahhh!!! Perfect timing. You’re going to love these, Courtney!